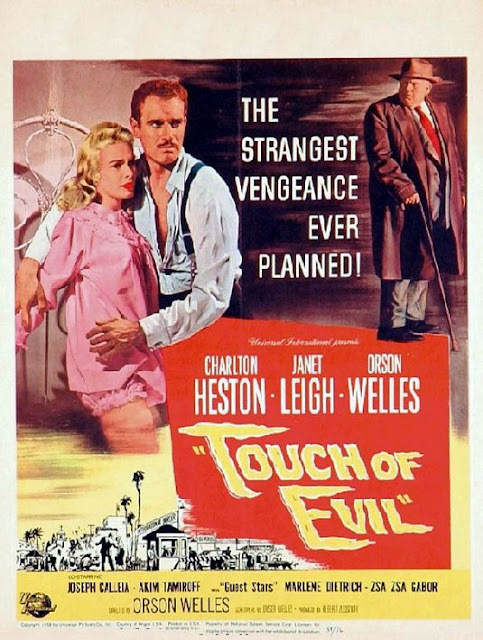 Orson Welle's masterpiece will be showing at the Detroit Film Theater tomorrow January 14th at 4pm! More info HERE! "Orson Welles’ noir masterwork about the downfall of corrupt police detective Hank Quinlan (a padded, putty-nosed, whale-sized Welles) was severely cut by the studio upon its initial release; nevertheless, it quickly gained an underground reputation as one of Welles’s most brilliantly atmospheric and emotionally evocative films. This 1998 restoration was based on the famous Welles memo to studio heads, describing precisely what his final cut should look like. The swirling camerawork and delirious, seamy plot twists are richer than ever in this definitive version, featuring memorable performances from Welles, Charlton Heston, Janet Leigh, Ray Collins, Akim Tamiroff, Joseph Calleia as Quinlan’s misguidedly loyal partner, and, best of all, Dennis Weaver in a small but indelible role as the seedy Mirador Motel’s manic, demented “night man.” Cameos by longtime Welles associate Joseph Cotten, Zsa Zsa Gabor, and the great Marlene Dietrich as the owner of a bordello whose chili “may be too hot for you.” (112 min.)" Hey Matt, Quite possibly my favorite film noir along with Kiss Me Deadly (The Maltese Falcon, The Killing & The Killers also rank high). The Henry Mancini soundtrack is a must have. Would be great to see it on the big screen. Happy New Year! It was spectacular Warren! Happy New Year to you too!